The easiest (and fastest) way to prepare for your TABE exam is to use Test-Guide.com's sample TABE questions. Our sample tests require no registration and are completely free. We have organized our questions based on the official TABE test outline. 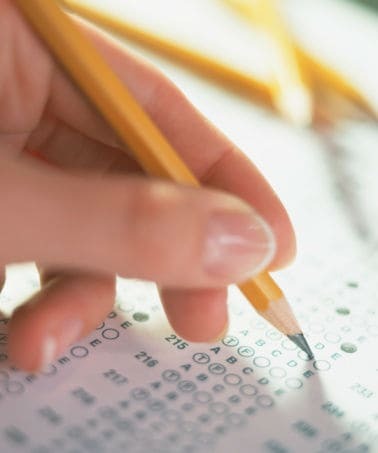 After you have completed the practice quiz, you will be presented with a score report which includes a complete rationale (explanation) for every question you got wrong. We will be adding more sample test questions in the near future, so please come back often. If you like these TABE practice questions, please make sure to like us on Facebook! Increasing Your Speed – There are time limits on all of the TABE subtests. Although most students who take the TABE feel that there is sufficient time, taking the TABE practice tests with self-imposed timers help you budget your time effectively. Focusing Your Preparation – Taking sample tests will help you understand the areas you know well…and the areas you are weak on. Many students waste a lot of valuable study time by reviewing material that they are good at (often because it is easier or makes them feel better). The most effective way to study is to concentrate on the areas that you need help on. Gaining Familiarity with the TABE Test Format – The TABE exam, just like every standardized test, has its own unique format. As you take practice TABE tests you will become comfortable with the format of the actual TABE test. Once the test day arrives you will have no surprises! Improving Your Problem Solving – The more sample questions you see, the better problem solver you will become. Solid problem solving skills will be crucial for you to achieve a passing score on your TABE exams, especially the TABE mathematics portion. Prepare for your TABE exam the right way…and you will score your highest!